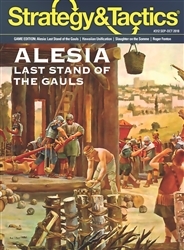 Alesiais a two-player game of the epic battle between Roman and Gallic forces in 52 BC. The battle pitted two of the great Leaders of that era against each other: Julius Caesar and Vercingetorix. This began as a Roman siege of the Gallic fortress at Alesia, and concluded with a decisive battle. The game system emphasizes command control. Players pick command markers to generate actions, modeling the chaos of the original battle. The Gallic objective is to break out of Alesia and link up with the relief army coming in from off the map. 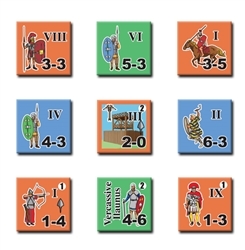 The Roman’s (caught in the middle) objective is to defeat the Gauls and eliminate Vercingetorix. There are two players in the game: Roman and Gauls. The game consists of three Days of Battle. Within each day, there will be several turns based on the command markers. 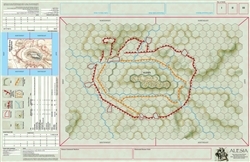 There are 176 5/8in counters, with a 22x34 inch map depicting the area around the fortified village of Alesia and the Roman fortifications and towers surrounding the village.